Human tumor xenografts grown in animal models are essential for in vivo characterization of experimental oncology therapeutics. Tumor xenografts are limited to a maximum of 10% of the total animal body weight. In mice with body weights topping out at 20-30 grams, the tumors can only grow to 2-3 grams or 2,000-3,000 mm3, limiting the data that investigators can obtain per mouse for molecular analysis, drug exposure and PK/PD, as well as immune cell infiltration. Due to these small tumors, individual mice are often terminated from the study in order to obtain enough material for analysis. This results in an increased number of mice used and data comparisons that are less than ideal. The OncoRat reaches weights of 200-300 grams, permitting tumors in the range of 20,000-30,000 mm3. 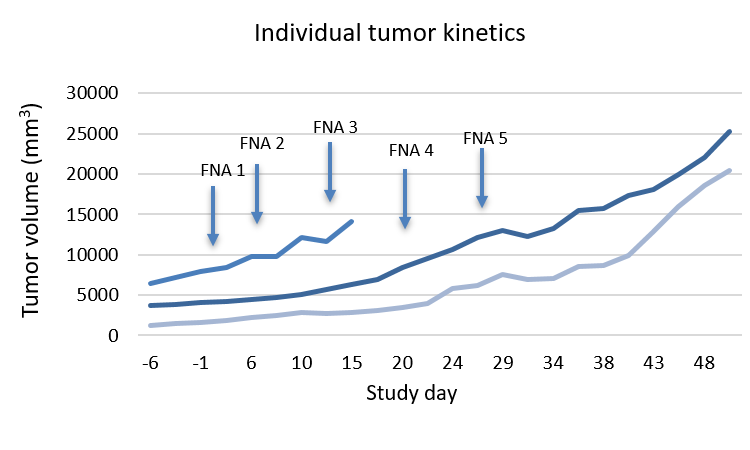 These larger tumors enable serial biopsy and Fine Needle Aspirate (FNA) to study tumor responses over time in the same animal without significantly effecting tumor kinetics. In this control study OncoRats bearing MDVR drug resistant VCaP prostate tumors underwent one FNA core sampling weekly for four weeks and four core samplings in week five. The tumor samplings can be prepared and used for molecular analysis, tumor PK/PD, and immune cell infiltration without taking rats out of the study. Three MDVR drug resistant VCaP tumor bearing rats were sampled once weekly using a 21G needle FNA for the first 4. One of the tumor bearing rats reached tumor diameter endpoint after week 3. 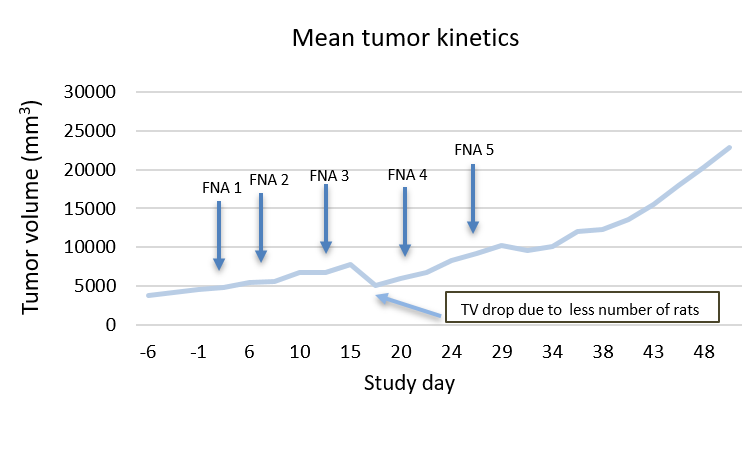 In week 5, 4 cores were sampled from each tumor with the tumors recovering growth pattern within a week.